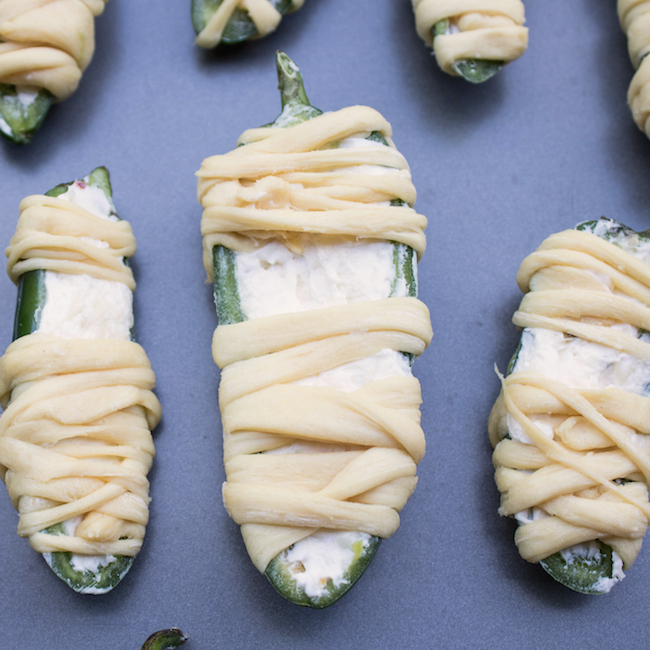 I’ve never been a huge fan of jalapeños, but when they’re stuffed with cheese and wrapped with crescent dough, they’re a game changer, and just look at how stinkin’ cute they turned out! 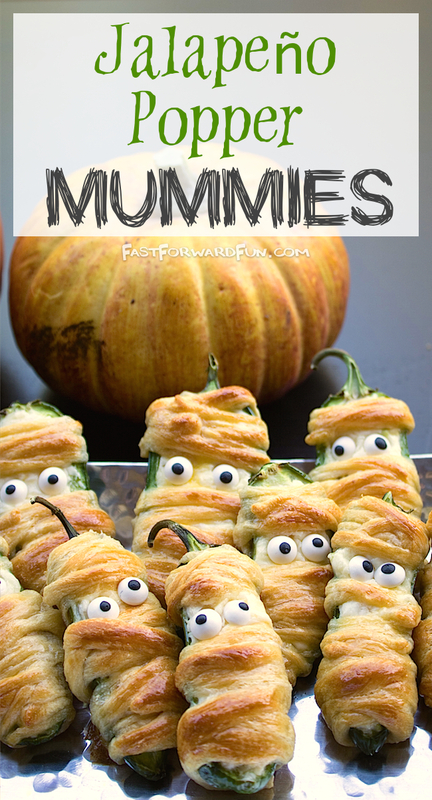 And, yes, those are candy eyeballs. Sound strange, but I couldn’t think of anything else to use for the eyes. 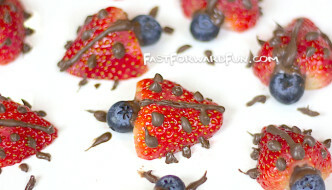 I pulled mine off before eating them, but my husband liked the added sweet taste. 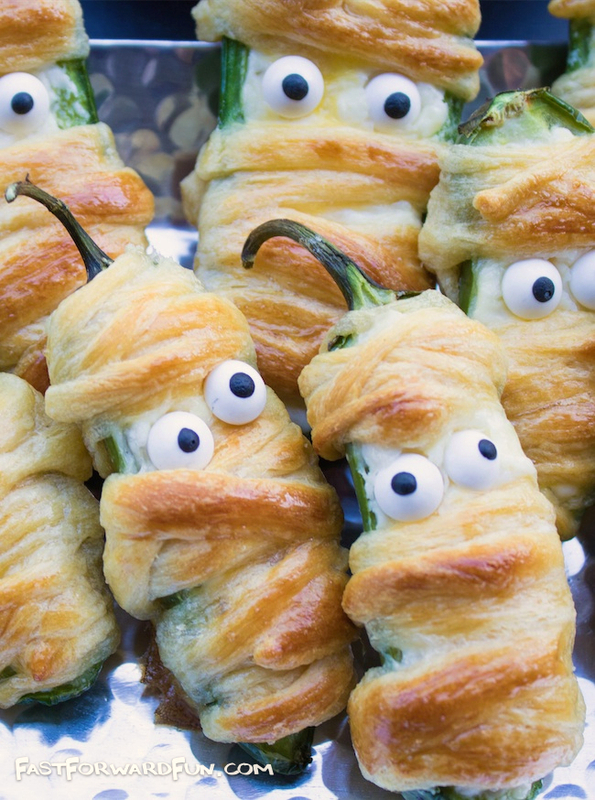 This is more of a Halloween snack for adults (some of them were blazing hot! ), but I think Halloween should be just as much for adults as it is for kids. We may be too old to trick or treat, but that doesn’t mean we can’t eat half of the candy they bring home. 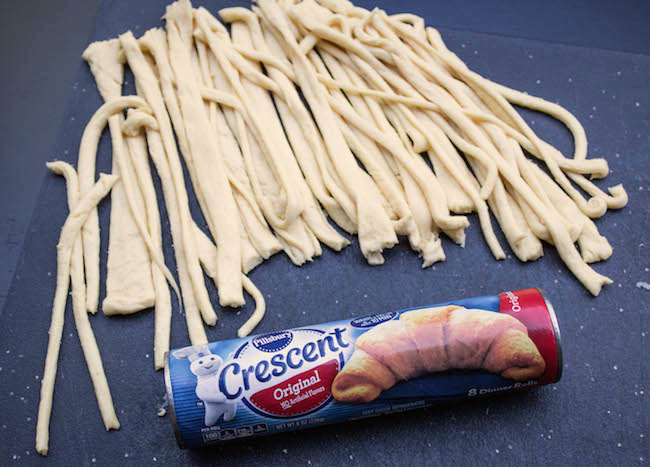 ***I could have used another roll of crescent dough for this recipe because I started off cutting the strips too thick, but one roll will do just fine if you cut each rectangle into at least 10 strips. But if you’re worried about running out, go ahead and prep 2 packages. You can’t have too much dough, right!? 1. 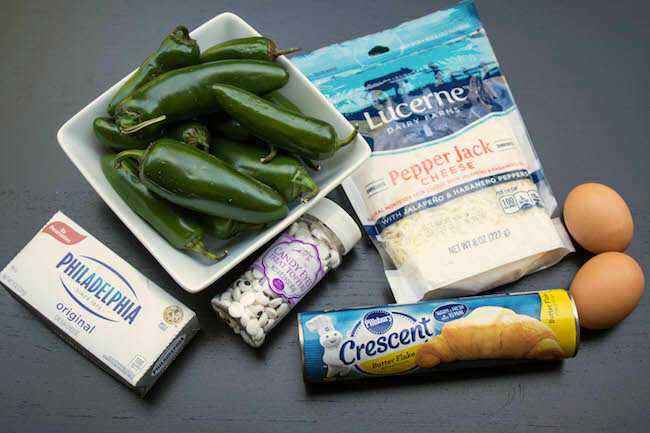 Get your cream cheese out of the fridge and let it sit until it’s close to room temperature. 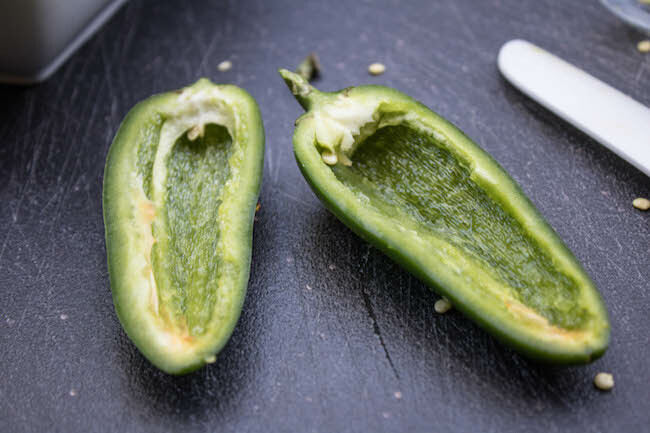 Cut your jalapeños in half length wise, trying to leave the stem attached (they’re cuter and easier to eat this way). 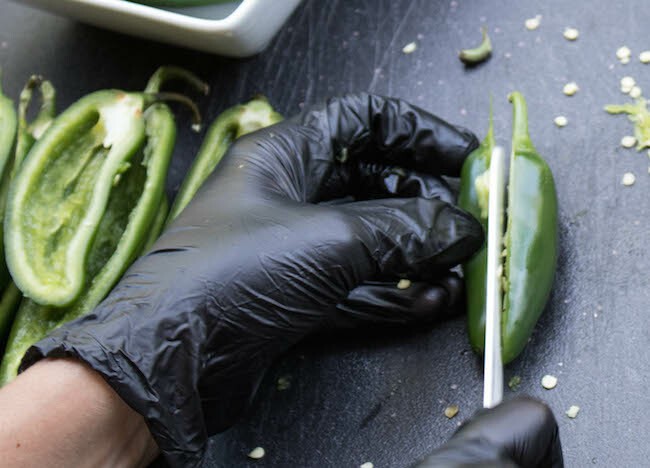 Just be sure to WEAR GLOVES because the jalapeños can really sting, especially if you have any nicks or cuts. 2. Scrape out all of the seeds and guts. A small spoon might help with the scraping, but the jalapeños I used were really easy to clean out with just my gloved hands. 3. 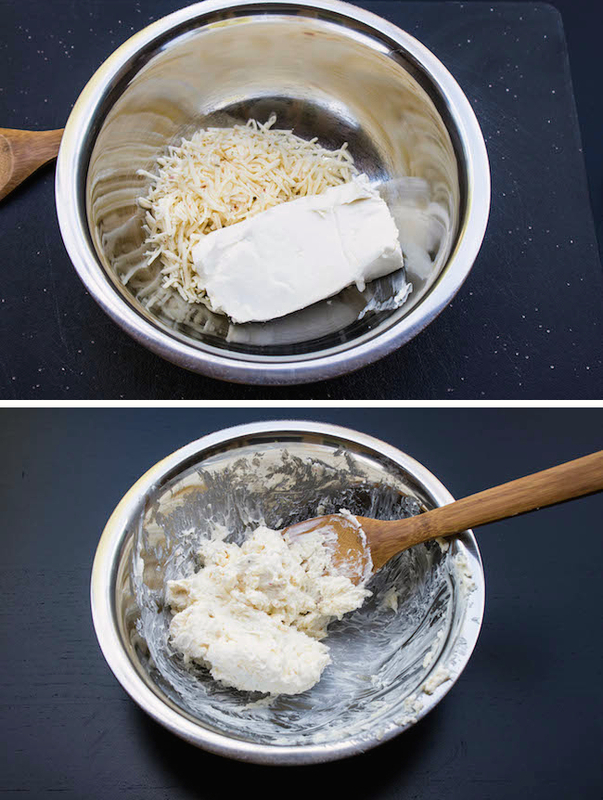 Mix together 8 ouches of room temperature cream cheese, 1 cup of pepper jack cheese, and a little garlic and/or salt to taste if you like. Set aside. 4. 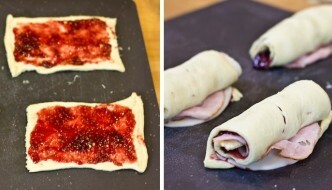 Open the crescent rolls and use your fingers to smoosh together the crease in the dough to create 4 rectangles. 5. 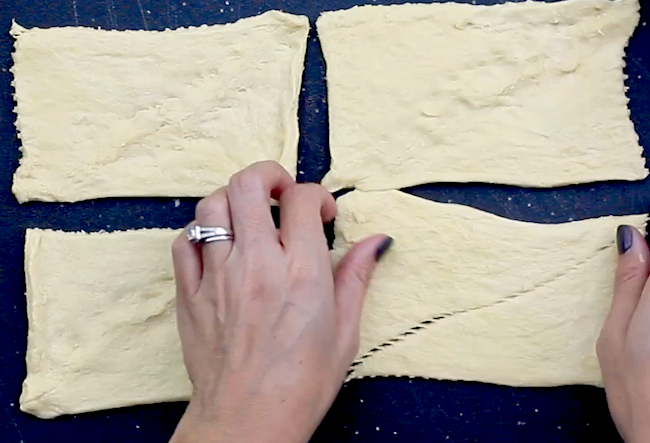 Use a pizza cutter to make about 10 long strips out of each rectangle. 6. 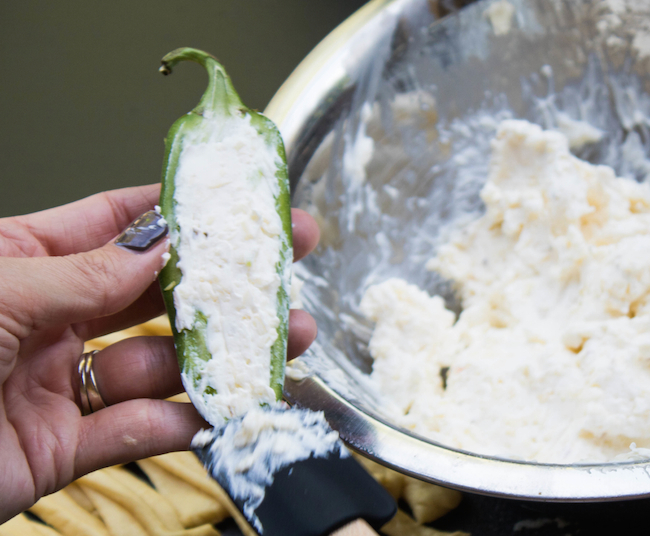 Use a small spatula or spoon to fill your jalapeño halves with your cheese mixture. 7. 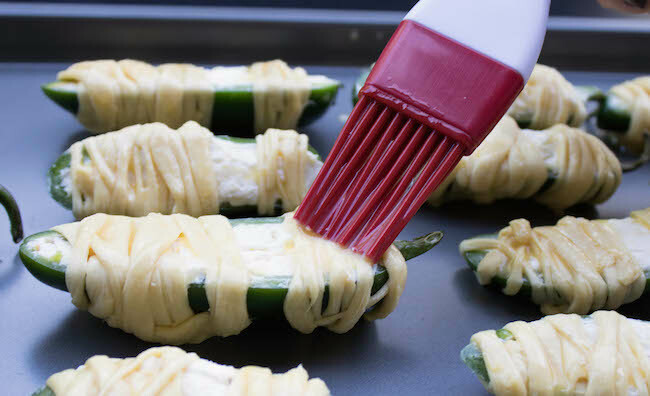 Wrap the cheese filled jalapeños with your crescent dough strips, leaving a small gap about a quarter of the way down for the eyes. I ended up using 2-3 strips of dough for each one, just depending on how large they were. 8. Whisk 1-2 eggs together until well blended. 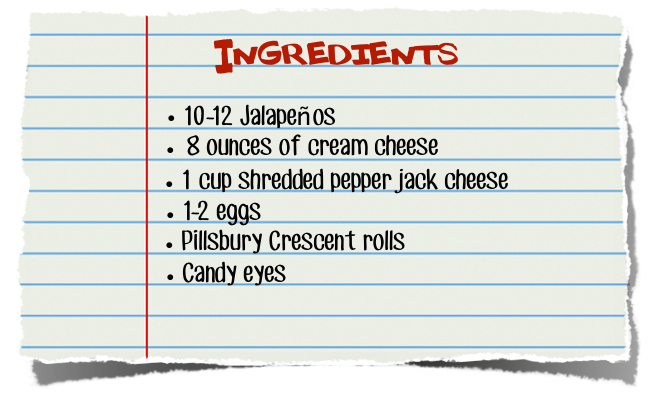 Place your wrapped jalapeños on a baking sheet and give each one a good rub down with the egg. 9. Bake in a 400 degree oven for about 10 minutes. You may need to keep them in there a little longer, so just keep an eye on them. The dough should be golden brown when finished. 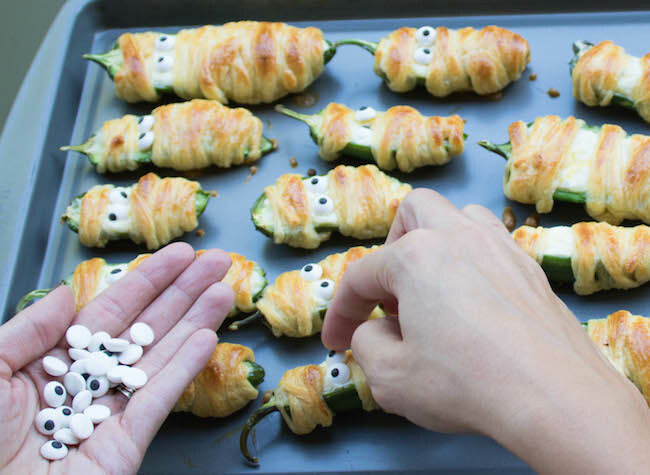 After cooling for a few minutes, place 2 candy eyes on each one where you left the gap in the dough. Aren’t they just the cutest!? And guess what, they tasted excellent, too. Some of them turned out really mild, while others were hot. 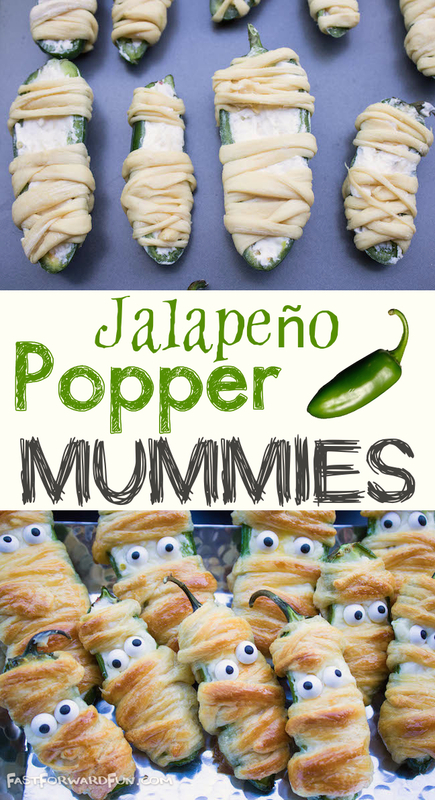 I suppose every jalapeño is a little different, but a lot of that has to do with the age. They get hotter as they age, eventually turning a red color, and I did notice that a few of the jalapeños I gutted were an orange color inside.